Muzik For U Mobile DJ's are your Pro Sound Choice that have been in business since 1996. Muzik for U has all types of music, professional DJ's, and pro sound equipment to provide you with the best service. Specializing in weddings, we only book a few events a year so that we have the time to customize your special day. Teri and Clark have over 40 years of combined experience in mobile disc jockeying... and it shows in the details. Bose and Peavey speakers, Mackie and Peavey amps, OTS-AV audio programming... Pros using pro equipment to provide you with a pro experience. We cater the event to you. 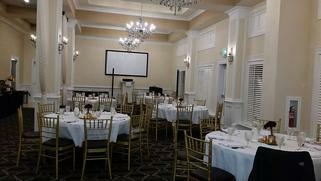 Do you want an elegant event with dinner music or a fun party that lasts all night? Are there certain songs or styles that you love, and are there ones that you can't stand? We have a questionaire where we ask the questions that helps us understand exactly what you want. There are no 'party playlists' here that are a 'one-size fits all'. We customize it FOR YOU... because that's what we are here to do! Think you cannot afford the Pros from Muzik For U? We have economy packages starting at just $400! Our most popular package, The Basic, is only $500! See our Packages Page for more information.